Recently saw that someone spotted a 2:39 video clip posted on YouTube that explains Bose-Einstein Condensation. Not sure where the video is from (there is a small BBC Hour logo on the screen, so perhaps its a BBC Documentary or something). Need to find that out. If anyone knows, please post a comment or email us! At any rate, the video clip is short, and explains BEC in an accessible manner. It doesn't go too deeply into the details of the theory or its implications, but its fun to watch. I especially like the beginning segment where people in an amusement park are spinning around, and flying off the ride! I haven't posted in a long time, but that doesn't mean that the S N Bose Biography Project hasn't been moving apace! On the contrary, I've been spending the last few weeks interviewing more people (many of whom, unfortunately, are getting on in years), and scanning hundreds of photos from the family archives. The design for the first Biography Project product is underway, and we're all excited. Won't say what it is just yet, but come back and see in a few months! Been having to read a lot of history of quantum physics, history of science in the west and in India, as well as the politics of language and nationalism. Fascinating stuff, although I must say, a bit daunting. Trying to make sense of it all through the lens of Bose is turning out to be quite an adventure. We've also redesigned the Satyendra Nath Bose website. We've had a site for awhile but weren't happy with it. We've redesigned it to be more elegant as well as easier to read. Hope you enjoy! We're motivated to keep adding more content. Please feel free to provide feedback and comments at info@snbose.org. Stay tuned, and thanks for your support! Last January (2006) I attended a function at Calcutta University (officially the University of Calcutta), the alma mater of Satyendra Nath Bose. The gathering was one of many ongoing celebrations to commemorate 150 years of the existence of the University — or what they more accurately (and cleverly) call the Post Centenary Golden Jubilee. 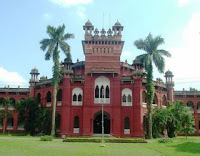 It was in 1857 that University of Calcutta, the University of Madras, and the University of Mumbai, were founded. On that day, among the speeches by dignitaries, including the Governor of West Bengal and the Chief Minister of West Bengal, the University formally released a reprint of a book that was originally published by the Calcutta University in 1920. The book is titled: The Principle of Relativity. Original Papers by A. Einstein and H. Minkowski, translated into English by M.N. Saha and S.N. Bose with a historical introduction by P.C. Mahalanobis. It is generally accepted, although not commonly known, that this publication was the first English translation from the original German of these famous papers — anywhere in the world. When I first learned this fact it struck me as remarkable that two young Lecturers of Physics and Applied Mathematics — Saha was 26 years old and Bose 25 — both entirely self-taught in physics, located in the far outskirts of the British Empire, a colonized people living under colonial rule, with very little access to the latest scientific publications coming out of Europe, were cognizant enough of the happenings in the world of science to embark on such a task in 1919-20. Even more remarkable was that when Saha and Bose did their translations, the Theory of Relativity was not yet a wholly accepted theory. The world did not completely accept it until the famous solar eclipse of May 29, 1919. That was when the English astrophysicist Arthur Eddington travelled to the island of Príncipe off the west coast of Africa to take pictures of the sun during the eclipse. Einstein's radical theory predicted that light from stars would curve during the eclipse due to the gravitational pull of the sun. Eddington published his observations verifying Einstein's predictions in 1920. But as soon as word got out of Eddington's findings, it was, as Einstein biographer Abraham Pais proclaimed in his classic book, Subtle is the Lord: The Science and Life of Albert Einstein (Oxford University Press 1992), the day Einstein was canonized — becoming the first celebrity scientist of the 20th century. When I first read this, I smiled to myself and thought, only half jokingly, that the mysterious third person(s) might have been Bose and Saha! Part II: A Historical Novelty or Getting It Right? Saha and Bose's translation of Einstein's Principle of Relativity was the first English translation available anywhere in the world. All this is not to say that there weren't "issues" or problems with the translations. The critics were not kind, noting the lack of literal translation of the text, problems with the mathematics, pagination problems, missing footnotes, etc. However, while there were problems, it was generally appreciated that this work had been done as early as it was, and by such young thinkers. Bose translated Einstein's 1916 paper on the foundation of the general theory of relativity. (Quoting Bose) "Relativity was of course a magnificent structure already. Special theory was a fascinating thing, four-dimensional representation, the work of Minkowski, just splendid. We studied all these papers and translated them. "Later on other people took up the translation of Einstein's relativity papers. Einstein had given the translation rights to the Methuen people. They wanted to stop the distribution of our work. Einstein was very generous. He said that as long as the book remained in circulation inside India, he had no objection. After the excitement of the first year or so people dropped making inquiries about the book. It is out of print." The M.N. Saha and S.N. 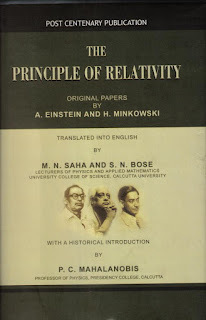 Bose translation of Einstein's papers on relativity, published in 1920 in Calcutta, does not contain the error which C.B. Jeffry and W. Perrett committed in their well-known 1922 translation. It concerns Einstein's definition of simultaneity at the very beginning of the kinematical part of Einstein's famous 1905 paper 'On the electrodynamics of moving bodies' (Annalen der Physik, vol. 17). The British translators misread Einstein's 'nun' as 'nur' and rendered thereby erroneously a sufficient condition as a necessary condition, thus excluding the possibility of alternative definitions of simultaneity, a possibility contended by the proponents of the so-called conventionality thesis of distant simultaneity (Reichenbach, Grünbaum and others). — Letter dated 10 October 1993. If Bose and Saha were alive today, I think they would have taken a certain pride in the fact that at least this part of their work had shown them to be more correct than the British. After being the first to translate Einstein's Relativity theories from German to English, Saha and Bose continued to blossom in their career. They, along with P.C. Mahalanobis, who wrote the introduction, went on to have illustrious careers. Meghnad Saha (1893-1956; Fellow Royal Society 1927; also here) went on to become world famous for his Saha Equation on the thermal ionization of elements, a basic tool to determine the spectra of stars and to determine the ionization elements of the stars. Among his many other notable achievements was the development of numerous scientific institutions in India, including the Saha Institute of Nuclear Physics, the journal Science and Culture (published by the Indian Science Association and started by Saha in 1934), and being in charge of river management and development for the Government of India. Saha and Bose were classmates since their childhood, and had a sometimes contentious, but always close, lifelong friendship. 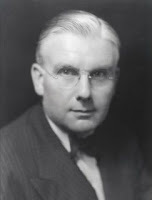 Bose went on to discover Bose Statistics (1924), Fellow Royal Society 1958, and other things that we will cover in this Blog. Prasanta Chandra Mahalanobis (1893-1972, Fellow Royal Society 1945) is considered the father of applied statistics in India, and was one of India's leading planners. He was, among other things, the founder of the Indian Statistical Institute, as well as personal secretary to the Poet Rabindranath Tagore (Asia's first Nobel Laureate winning for Literature in 1913). Indeed, there is a widely repeated anecdote that when Einstein met Tagore (possibly in 1930) and asked "How is that bright young man Bose?" Tagore was perplexed since the Bose that he did know (the famous physicist Jagadish Chandra Bose) was far from being a young man at that time. He is said to have asked his secretary, PC Mahalanobis, about this Bose, and Mahalanobis was said to have proclaimed, "Oh, he means Satyen Bose!" Tagore was intrigued, and said that he would like to meet this Satyen. 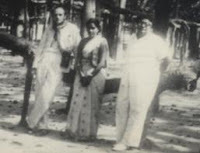 Mahalanobis facilitated an introduction that lead to an ongoing relationship till Tagore's death in 1941. Bose's mother was said to have said with pride that "it was Albert Einstein who told Gurudev about my son, and Gurudev himself asked to meet him..."
The relationship between Bose and Tagore blossomed around a mutually held passion of teaching science (and literature) in the "mother-tongue" of Bengali. Indeed, one of Tagore's last works was Viswa-Parichay [বিশ্ব-পরিচয়] (Our Universe 1937, translated by Indra Dutta 1958), a science primer written in Bengali, which he dedicated to Bose. Many years later, Bose went on to be appointed Vice-Chancellor of Tagore's university, Viswabharati (Santiniketan) in 1957. While this is old news (2001), this post does provide some background on the significance of Bose Einstein Condensation in the world of Physics. This is copied from the Nobel Prize page on www.snbose.org. More information is directly available on the NobelPrize.org website. Bose Einstein Condensate is explained on Wikipedia. 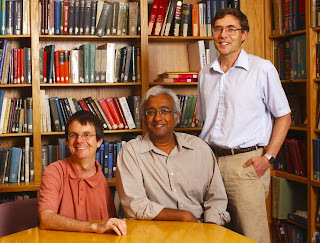 The first Nobel Prize in Physics in the 21st Century was awarded jointly to Professor Eric Cornell and Professor Carl Wieman of JILA and National Institute of Standards and Technology (NIST), Boulder, Colorado, USA, and Professor Wolfgang Ketterle of the Massachusetts Institute of Technology (MIT), Cambridge, Massachusetts, USA, for the achievement of Bose-Einstein condensation in dilute gases of alkali atoms, and for early fundamental studies of the properties of the condensates. Below are some links to information about the Nobel Prize, mostly from the NobelPrize.org website. All linked content (video, etc.) are copyright © Nobel Web AB 2001 and are presented here as hyperlinks. Nobel Laureates in Physics interview with Drs. Cornell, Wieman and Ketterle with Joanna Rose, science writer on 12 December, 2001. The Laureates talk about their memories of the day of the discovery, the importance of competition (5:51), the significance of producing the condensate (11:44), big issues in physics (15:01), receiving the Nobel Prize at an early age (21:49) and their future work (25:36). 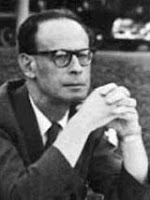 This WebLog (Blog) is launched in January 2007, 113 years after the birth of my grandfather, Professor S.N. Bose (1894-1974), fondly also remembered as Satyen Bose by many — best known as the founder of Bose Statistics (also often referred as Bose Einstein Statistics), a fundamental component of modern quantum theory and the basis of Bose Einstein Condensation. A lot has happened in these 113 years, and a lot continues to happen especially in the frontiers of physics and science in general. Over the next weeks and months we will document and discuss news on Bose Einstein, share stories of interest in the world of science, and periodically recount vignettes of my illustrious ancestor S.N. Bose, a remarkable figure who lived a colourful life which very few people know about. I hope that this blog will be informative, entertaining, and even a bit inspiring. The SN Bose website has more information about S.N. Bose and the S.N. Bose Biography Project. Please visit www.snbose.org.